This wedding cake was a elegant design and a little challenging. The Diamond design is created by heating my metal spatula and melting the icing into the design. It’s tricky because you can’t melt it too deep. 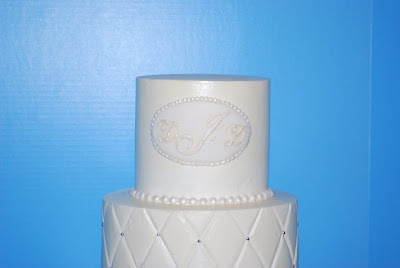 The fondant oval is lined with pearls that are then painted with luster dust. The scroll work took about 3 hours, but it came out pretty good! 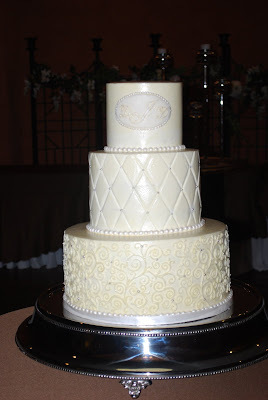 We delivered this wedding cake to Trevitt Hall in Dalton, GA. I think that catering hall is more beautiful every time I go there. They just out do themselves!